Winter is nearing its eventual end (or so we hope! 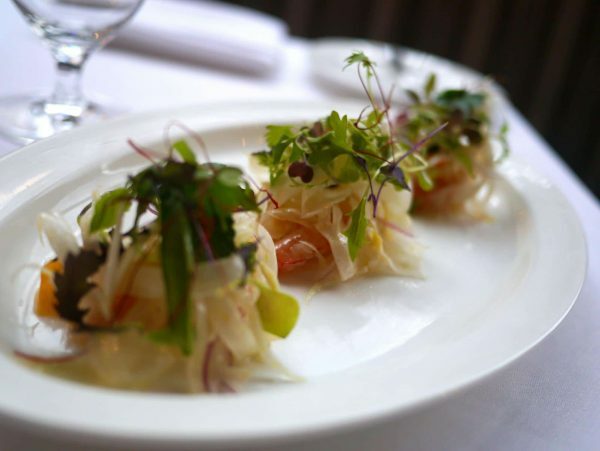 ), and as the sun moves higher in the sky, so does our menu change to embody the flavors of an emerging season. Our new à la carte dishes reflect the fusion of late winter with early spring, making the most of winter’s surplus while incorporating spring nuances in the form of mushrooms, scallions, spring onions, spinach, and more. Our new first course features are a veritable trip around the globe. 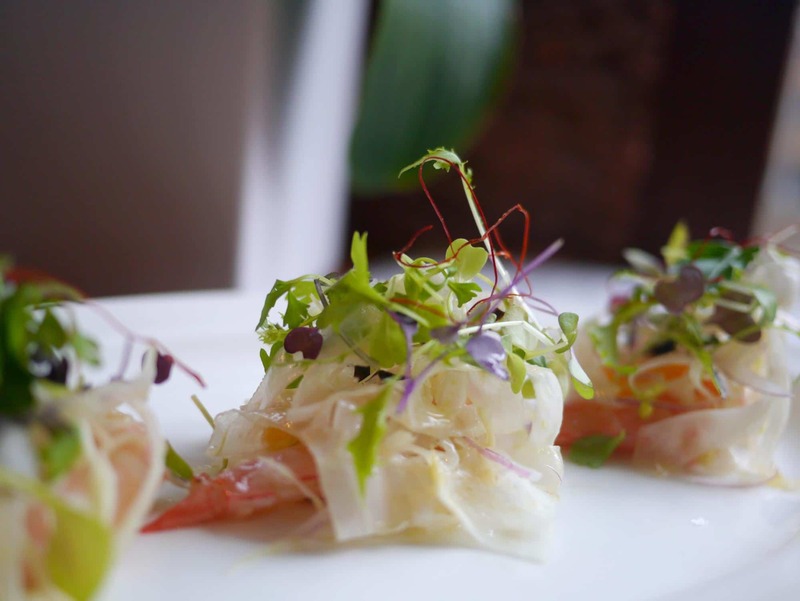 For example, this dish of Wild Pink Shrimp was inspired by last year’s culinary cruise to Italy, where Chef Matt and co. enjoyed a beautiful salad of poached shrimp, fennel, onion, and olive in a little town called Siracusa, Sicily! We wanted to replicate their experience in our own salad, which uses wild pink shrimp from Florida, navel and cara cara oranges that are currently at their seasonal peak, fennel, raw red onions, dehydrated black olive, and Calabrian chili oil for a touch of heat. You can taste Matt’s inspiration in every bite! 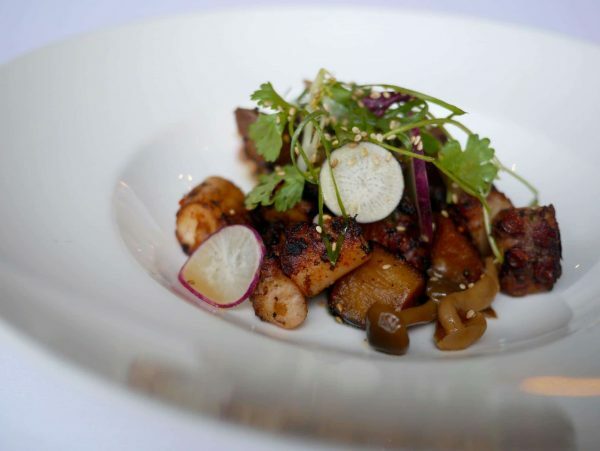 Our new variation on Charred Spanish Octopus was modeled after an experience Matt had in Japan a few years ago, where he was working with a fellow chef to execute a market test for a restaurant concept. Sweet potatoes and winter radishes from Wishing Stone Farm evoke memories of sweet potatoes cooked with soy and sugar and Black radishes back in Japan… to which we added pickled mushroom, toasted sesame, and cilantro to create a dish that makes great use of our pantry stock and the abundance of root vegetables being offered by local farmers. 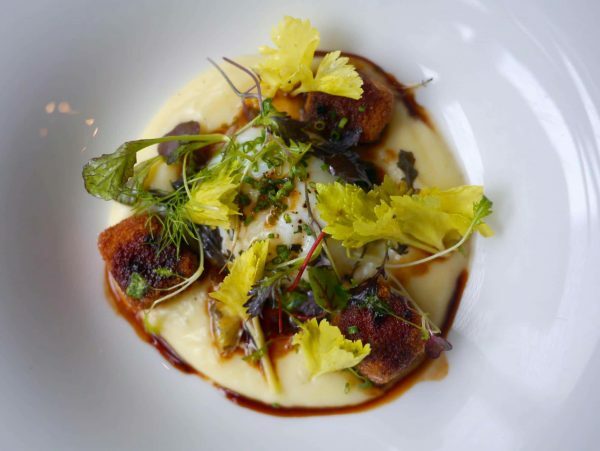 The Slow Poached Zephyr Farm Hen Egg brings it all back home with its medley of quintessential New England flavors: pork belly croutons, Pommes Aligot and black truffle jus topped with a celery leaf salad. This is a delightfully rich dish, and one that’s worth every mouthful! Our new second courses, again, make excellent use of the late winter abundance coming in from local farms and infuse them with classic New England character. We’re loving the Maine Haddock featuring Nicola potatoes, creamed leeks, winter spinach, celery, and delicate herbs, all coming from local producers such as Wishing Stone and our good friend Steve Ramos Organics in Bristol, RI. The Roasted Cod Loin is comforting and nostalgic, reminiscent of one of the first dishes Chef Matt ever cooked and enjoyed—a “soulwarming dish,” in his words! 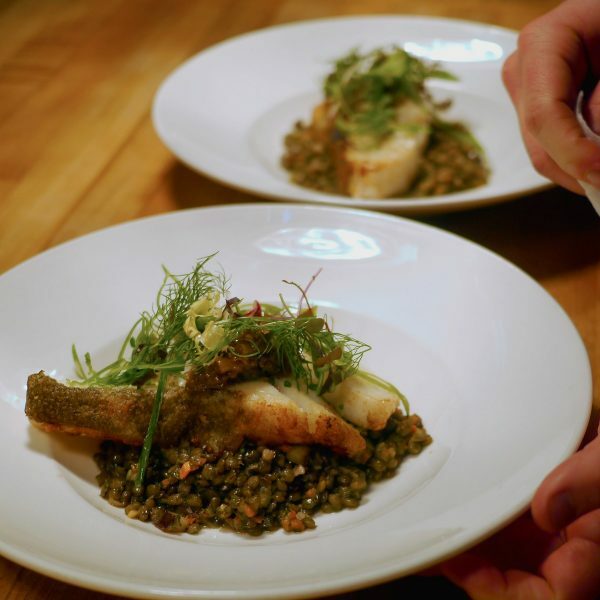 The sweetness of the cod meets the tangy bite from caramelized shallot jam, along with smokey bacon and French green lentils. This is a simple dish, not overdone in the slightest, and one that demonstrates how just a few ingredients can work together in perfect harmony to create a magical ode to minimalism on the plate. Other locally-sourced delights include Swiss chard from Schartner Farms—featured in a dish of Crescent Farms Duck with rye spätzle, roasted rutabaga, and sour cherry reduction—as well as carrots and turnips, also from Schartner, plus blue cheese from Great Hill in Marion, MA, all sharing the plate with a 20-day Dry Aged Ribeye with potato croquettes and sauce Bordelaise. The menu as a whole truly emphasizes what we have to work with right now, in these final days of winter, reminding us to get creative with what’s readily available and to be thankful for the beautiful bounty that the land has to offer!